It's not brownie-induced paranoia you're experiencing. Marijuana K-Cups are real, and you can already get them. 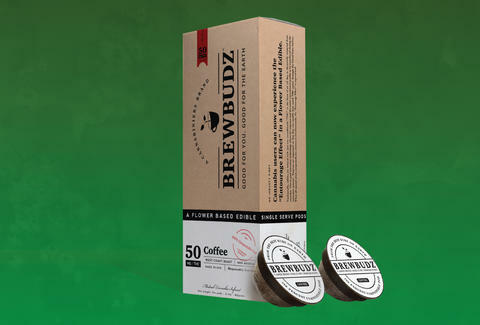 Cannabiniers, a company that makes pot treats, has launched the world's first cannabis K-Cups called BrewBudz. Residents of Nevada, a state that only recently began selling legal marijuana and is now under a weed emergency (no, really), can get their high in a cup of coffee, tea, or cocoa brewed from a single-use pod. The pot of pot is only available in Nevada, but the company plans to roll out to Colorado and California in the coming months. The sustainably-made compostable K-cups (unlike the other, environmentally dubious K-cups) come in 10mg, 25mg, and 50mg doses. It's available in regular and decaf coffee; black, green, and herbal tea; and a "decadent dark chocolate" cocoa. All of the above ought to significantly alter your morning routine and the subsequent 9-to-5 slog. “What we are aspiring to create is the normalization of cannabis consumption in a way that integrates with consumers’ already established habits and lifestyles,” Timothy Walters, President of Cannabiniers, said. In other words, hit 'em where they live with weed tea bags. But success or not, if you don't live in Nevada, you'll just have to have boring old jitter-inducing coffee. On the upside, it might help you live forever.